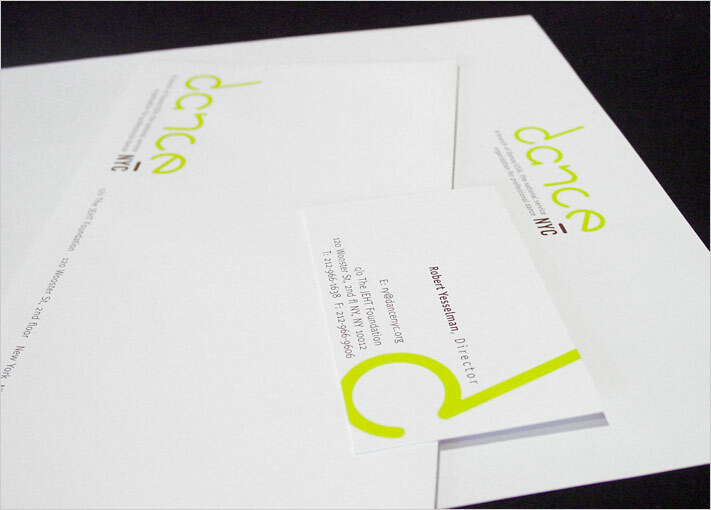 Dance/NYC, a newly formed service organization dedicated to the needs of New York’s professional dance community, engaged Cabengo to develop an identity and web presence. The identity needed to position dance as a dynamic and relevant art form; link “dance” inextricably to “New York;” and acknowledge Dance/USA, the group’s parent organization. Inspired by the relationships among dancers on a stage, we developed the logo and stationery set as an ensemble of elements, each functioning independently yet also expressing a part of the whole. 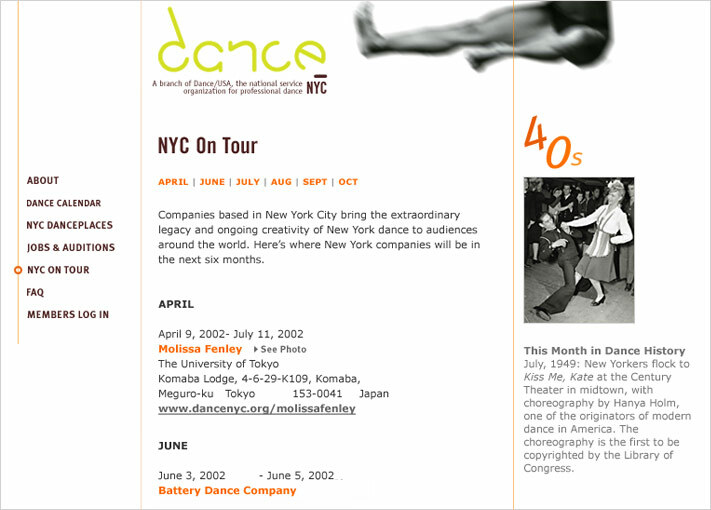 The website needed to serve as an online resource that went beyond its basic function of providing information to dance professionals and dance enthusiasts: it needed to engage and excite various constituencies about the role of New York City in the development of 20th and 21st century dance. 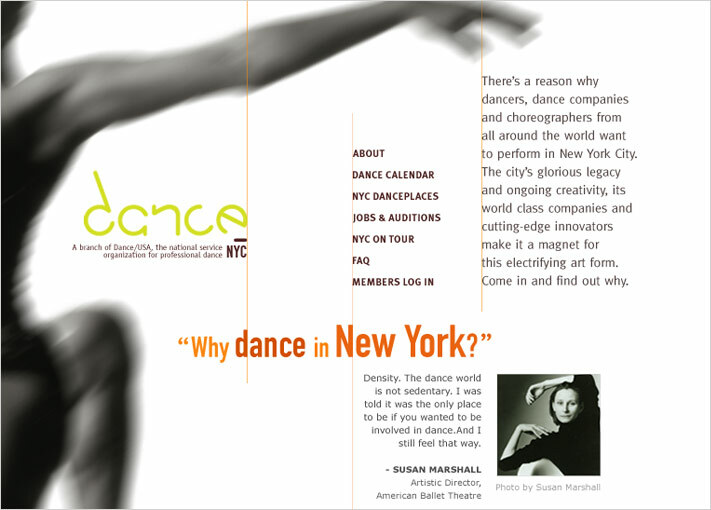 To personalize the story, we conceived “Why Dance in New York,” a homepage feature with alternating quotes and photos from some 40 dancers, choreographers, and directors. 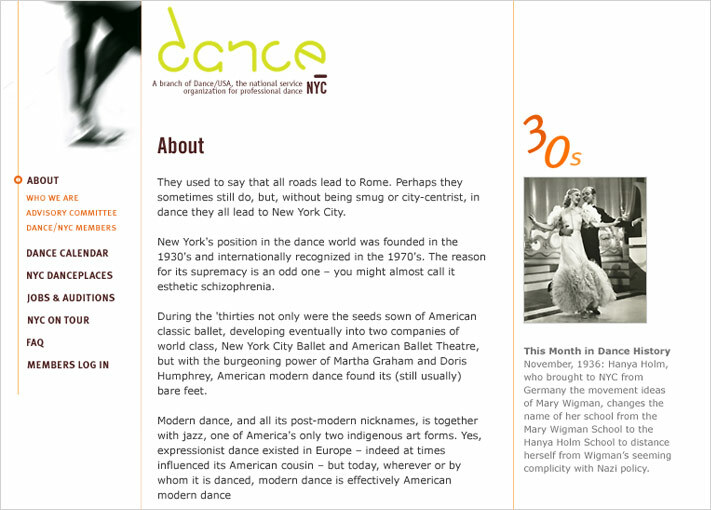 To position the dance legacy in the larger context of New York City history, we developed “This Month in Dance History,” featuring decade photos and off-beat descriptions of more than a hundred seminal moments in New York’s dance history. In dance, we were told, all roads lead to New York City. Thus, it was the City – the physicality, urbanity, culture and pace of it – that became the driving force behind the design of the website. To create a sense of movement and energy, without relying on bandwidth-heavy animations, we abstracted images of bodies in motion. The effect is to position dance as a vital field and a dynamic form, at once, established and evolving. 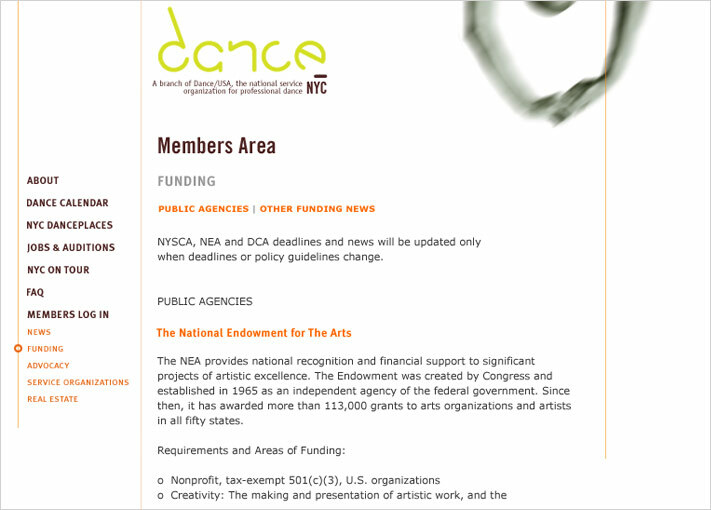 In addition to the public section, featuring weekly performance listings, jobs and auditions, and tour information, we developed a password-protected section for Dance/USA members, with information on funding opportunities, real estate issues, and industry news. To facilitate client maintenance after launch, we developed an easy-to-use content management tool.